The H 17 was designed by the Hutter brothers, Ullrich and Wolgang, in Salzburg, Austria. The ‘17’ indicated the glide ratio. 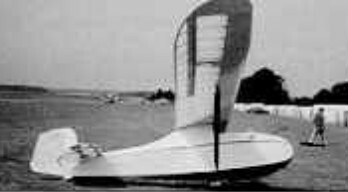 They sold plan sets until they joined Schempp-Hirth, which then built about five as the Goppingen 5 with the addition of a windshield and main wheel. Many were built from plans worldwide and several are still flying. A post-war version was developed and marketed as the H 17 B with enclosed cockpit, lengthened fuselage and airbrakes. The H 17B has slightly increased span and empty and loaded weights increased about 50%. One H 17 belongs to the National Soaring Museum. The Vintage Sailplane Association has plans. 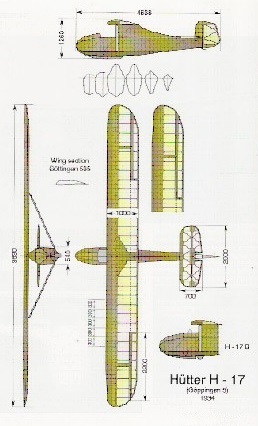 The structure was all wood, D-tube single-strut wing, plywood over simple frame fuselage, fabric cover.